"Let Sebastian by. Let Sebastian by", the team radio told Leclerc. Ferrari will face questions about the wisdom of their approach to the race - and to team orders in general - but Hamilton was serenely distant from such concerns. The Australian had run the medium tyre for a race-high 37 laps in his second stint, holding off Racing Point's Sergio Perez to finish seventh and best of the rest. The result puts the five-time champion at the top of the driver standings for the first time in 2019, with a six point lead over Bottas. Ferrari team principal Mattia Binotto told Sky that if his driver was upset, he was "right" to feel that way given how the race unfolded. Vettel had clear air to catch the Mercedes duo, but failed to make any impression on the leaders. Hamilton emerged still in the lead but Bottas was behind Leclerc. But it quickly became apparent that Leclerc was quicker than Vettel. He replied, clearly irritated: "But I'm pulling away" as he backed off and watched Vettel pass. It was a perceptive comment. He acknowledged that he had inherited the win at the last round in Bahrain after Leclerc suffered a mechanical problem while leading but this time the victory was entirely deserved. Sebastian Vettel criticized the media after being asked about a team order from Ferrari for Charles Leclerc to move over during the Chinese Grand Prix. Vettel ended up finishing third with Leclerc down in fifth. The stops had closed Vettel up to within five seconds but both Mercedes had fresher tyres and they proceeded to once again open up a solid lead, with Bottas three seconds off Hamilton and Vettel 11 back in third. It was a head-scratching afternoon for Ferrari who were never really in the fight for victory in Shanghai. Red Bull's Pierre Gasly was in sixth and took fastest lap, in front of the Renault of Daniel Ricciardo, his first finish this season. 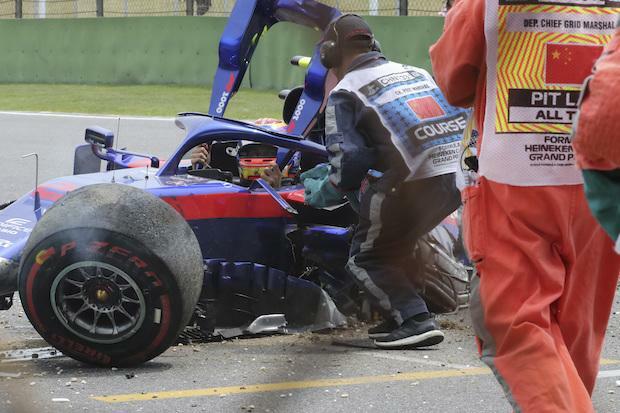 Kimi Raikkonen finished ninth for Alfa Romeo and Thailand's Alexander Albon, who started from the pitlane after missing qualifying due to a heavy crash in final practice took the final point for Toro Rosso.